This article is part of a weeklong series exploring a variety of issues affecting modern women. WASHINGTON, D.C. -- Latin Americans were the least likely in the world in 2012 and 2013 to say women in their countries are treated with respect and dignity. A median of 35% of adults across 22 Latin American countries said their women are treated this way -- about half as high as percentages in any other region of the world. Although notable progress in gender equality has been seen in recent years, this low percentage in relation to the rest of the world reflects how gender inequality and violence against women persist throughout Latin America. Less than half of adults in 17 of the 22 Latin American countries surveyed in the past two years said women are treated with respect and dignity in their own countries. 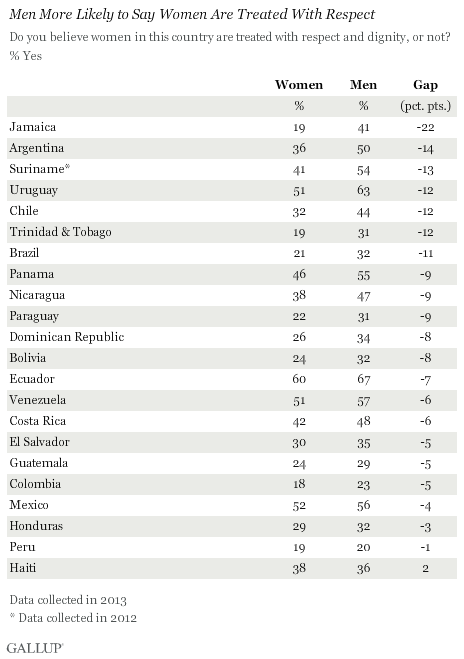 Within Latin America, Peruvians and Colombians were the least likely to say women are respected. Only one in five residents in each country said they are, which is consistent with findings from previous years. In both countries, this issue has captured the attention of the media and national governments. In Colombia, newly re-elected President Juan Manuel Santos declared a "National Day for the Dignity of Women" in response to the high incidence of violence toward women in the country. The Defensoría del Pueblo reported in November 2013 that 85 women are killed a month in Colombia. Another 924 are victims of sexual abuse, and more than 2,600 report familial violence. Leaders in Peru are working to criminalize sexual harassment in the street in response to increased incidents targeting women. 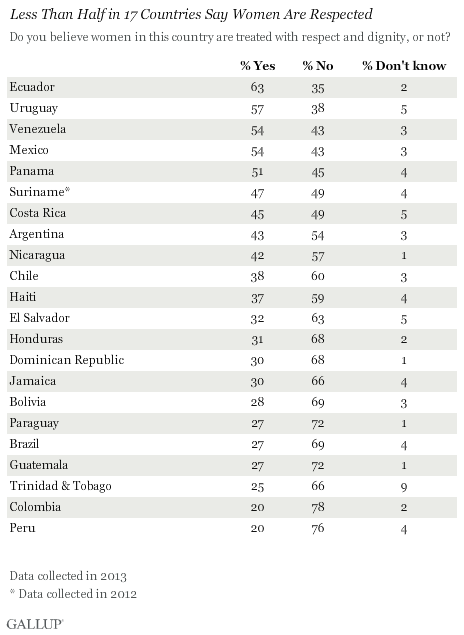 Adults in Ecuador were the most likely in the region to say women are treated with respect and dignity, at 63% -- a 17-percentage-point increase from 2012. Recent legislation aimed at protecting women (including harsher penalties for femicide) and increased media exposure may be partially responsible for this uptick, which brings Ecuador's percentage closer to those expressed in other global regions. 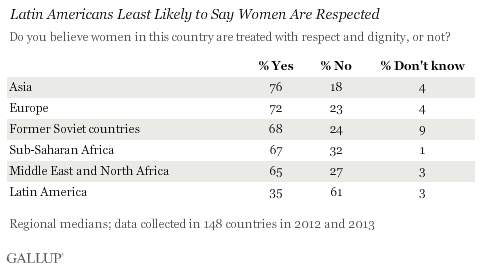 About half of adults in Uruguay, Venezuela, Mexico, and Panama say women are treated with respect and dignity in their countries. But women in Latin America are not alone. Latin Americans were also less likely than people in other regions to say children are treated with respect. Both could be related to Latin Americans' security concerns, which have consistently ranked among the highest in the world. The United Nations recently reported that women and children are particularly vulnerable to violence in this region. Media coverage of the increasing violence could be raising the public's awareness of the challenges women and children face. Men are more likely to say women are treated with respect and dignity than are women in most countries in Latin America, suggesting that some men in these countries have either less awareness about the experiences of women or a different interpretation of respect, perhaps influenced by machismo attitudes. The largest differences in sentiment exist in Jamaica, Argentina, and Suriname. Men and women in Haiti, Peru, Honduras, and Mexico have similar views. Although relatively fewer Latin Americans say women are treated with respect in their countries, the presence of several female heads of state in the region and other media exposure about this issue has likely contributed to a greater awareness and advocacy among residents in Latin America about the treatment of women. The United Nations recently affirmed the importance of ending discrimination against women and girls as one of its new sustainable development goals. There is also evidence that some governments in the region are taking the issue seriously and taking action to increase legal protections for women. However, it is unlikely that these policy changes alone will be enough to improve the treatment of women, especially as weak education programs, violence, and machismo attitudes persist. Data on this item are available in Gallup Analytics. For complete data sets or custom research from the more than 150 countries Gallup continually surveys, please contact us. Results are based on face-to-face interviews with approximately 1,000 adults in 19 countries in Latin America and approximately 500 adults in Suriname, Jamaica, and Trinidad and Tobago, aged 15 and older, conducted in 2012 and 2013. For results based on the total sample of national adults, the margin of sampling error ranged from ±3.5 percentage points to ±5.0 percentage points at the 95% confidence level. The margin of error reflects the influence of data weighting. In addition to sampling error, question wording and practical difficulties in conducting surveys can introduce error or bias into the findings of public opinion polls. In the U.S., entrepreneurs, especially women, are more likely to be thriving in purpose well-being than other workers. Entrepreneurs are also more likely than other workers to be thriving in both physical and community well-being. Out of the five elements of well-being, adults worldwide fared worst in 2013 in purpose well-being -- suggesting a global deficit in the number of people who actually like what they do each day and who are motivated to achieve their goals. Gallup's Negative Experience Index, a measure of people's experiences of stress, anger, sadness, physical pain, and worry, has crept upward since 2007, and currently stands at 27. Iraq tops the list.